The distance to Union Island was approximately 12 nautical miles from Canouan and was an easy sail. We entered Clifton harbor motorless with Patrick at the helm. The Stardust crew helped to guide us into the slip, which can be difficult under sail. Patrick did a great job. It would be a costly embarrassment to crash your chartered sailboat into the docks. The Stardust crew anchored for us, saving us the effort in the busy harbor. It gave Karen and I a little peace of mind after some of the mishaps we had suffered to date. Wally and Fritz, two islanders working for the charter company, came aboard and did the necessary engine repairs. After they left, we busied ourselves with our boating chores. 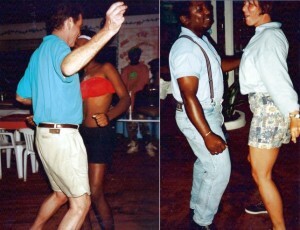 Karen danced a rumba as she cooked. Pat washed and hung his sheets out to dry. I set up the plates on deck for dinner. Suddenly our first bona-fide tropical storm hit. It came on quickly. The sheets Pat had put out to dry got wet instantly as they absorbed the big, heavy drops. When the rain began to gush we found ourselves scrambling again — this time to shut all the leading port holes. Dinner got soggy eating outside, but what a blast. Fed and happy, we decided that there was nothing better to do than head to another “jump up” — this time at Lambi’s on the island. 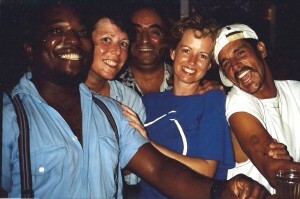 We all danced, hips swaying to the beat of the steel drums, and shared a few laughs and drinks before returning to our sailboat. Patrick and Karen “jumping it up” at Lambi’s. Sharing laughs at Lambi’s with the Stardust crew who repaired our boat’s motor — Wally & Fritz. One could get used to this island life. We said our goodnights and happily retreated to our respective cabins. My body had become completely adjusted to the boating lifestyle. The sloshing and slapping of water against the boat, as we gently rocked at harbor, lulled me into a blissful sleep. But we were rudely awakened in the pre-dawn hours to heavy winds, gusting up to 40 knots. Once again our anchor was slipping. Karen jumped out of bed first, and grabbed the grappling hook to push us away from the other boats with which we were about to collide. Half-asleep and scrambling again. 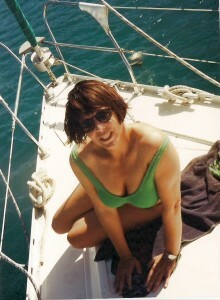 Sailing is not just about surfing the waves, handling the lines and navigating, but quick thinking and problem solving. We seemed to have had our share. The fact that the charter company crew had set our anchor lulled us into complacency. We fended off the other boats, pulled up the anchor, dropped it and set it again. We were now wide awake and ready for some strong coffee. Karen strikes a pose, enjoying her time on the bow of the boat. After breakfast we motored out to the open sea and set sail for Mayreau, our original destination before the smoking engine waylaid us. 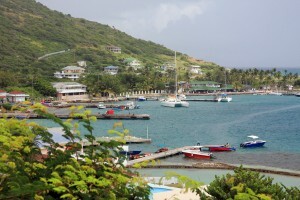 It is a mere 5 nautical miles to Mayreau from Union Island. Panorama of the southern Caribbean Sea.